Consumers have posted more than 1 million reviews of real estate professionals on Zillow.com in the last four years — nearly half of those in the last year alone, an acceleration in growth that points to the growing importance of agents’ profiles on listing portals. More than 780,000 agents have Zillow profiles, as do tens of thousands of mortgage lenders, home improvement pros, property managers and other real estate players. Screenshot of an agent’s profile on Zillow. Zillow first rolled out unfiltered consumer reviews and ratings on its real estate pro profile pages in 2010, and began allowing brokerages, multiple listing services and agents to publish them on their sites in November. Last July, Trulia followed Zillow’s lead by adding unfiltered reviews to its profile pages for real estate pros. 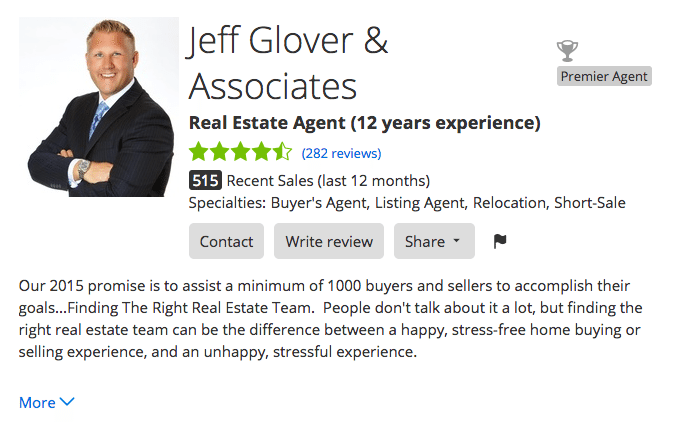 Unlike its competitors, realtor.com’s real estate pro profile pages feature “recommendations,” which are published at agents’ discretion. As they’ve gotten more prevalent, online reviews have become an important aspect of agents’ online lead gen strategy. Reviews are just one component of the rich profile pages Zillow, Trulia and realtor.com are now featuring on their sites in their quest to be the online intermediary between consumers and agents. Zillow and Trulia feature ratings and reviews, while all three portals feature transaction histories, biographical information and other info.